Cervical Cancer Global Crisis Card: Cervical Cancer-Free Coalition is excited to announce the new Cervical Cancer Global Crisis Card, created in collaboration with Global Health Strategies. The Crisis Card provides a snapshot of cervical cancer burden and mortality data from around the world. India has highest number of women dying from cervical cancer and Zambia has highest mortality rate. Australia provides a global model for dramatically preventing cervical cancer. More women die of cervical cancer in India than anywhere in the world. India along with China, Brazil, Bangladesh and Nigeria represent over 50% of the global burden of cervical cancer deaths. However, African countries are struggling to deal with cervical cancer too according to the new Cervical Cancer Crisis Card, which ranks countries from across the world based on the number of deaths from cervical cancer and the overall mortality rate. The Crisis Card is available on the Cervical Cancer Free Coalition website and is being launched globally to mark International Mother’s Day on Sunday 12 May. Cervical cancer kills an estimated 275,000 women every year and 500,000 new cases are reported worldwide. It kills women in all countries; in the US almost 4,000 women die of cervical cancer every year according to the Crisis Card. This entirely preventable disease is the second largest cancer killer of women in low and middle-income countries. The Crisis Card, shows that Zambia has the highest mortality rate for cervical cancer. However, there are reasons for hope too. According to the Crisis Card, Australia has the lowest cervical cancer mortality rate, which is due to the successful rollout of a comprehensive package of HPV vaccines, treatment and prevention. According to the Government of Australia, there has also been a decline in genital warts and cervical abnormalities among young women since the introduction of the HPV vaccine in Australia. The startling disparities between women in the developed and developing world are personified by cervical cancer. A woman in Zambia is 25 time more likely to die from cervical cancer than a woman in Australia and India has 750 times more deaths than Norway. This level of inequity is also reflected across gender indicators with girls less likely to attend school but more likely to be malnourished and married as a child. Unless life-saving HPV vaccines are prioritised by decision makers this inequity will remain. Coming in the same month as the global Women Deliver 2013 conference that will have a focus on gender and health equity in terms of the post-2015 framework (the follow framework to the Millennium Development Goals), the report is a timely reminder of the challenges facing women, especially in the low to middle income countries. By prioritising women’s health in the next developmental framework, world leaders would show that they’re serious about challenging inequity and building sustainable societies where universal rights are guaranteed for all. Cervical cancer is a taboo issue in many places as it is linked to sexual reproduction and cancer. Unless women’s groups and civil society join together to lead movements that break through stigma, patriarchy and other societal barriers, we will continue to see large numbers of deaths and high mortality rates. Projections show that by 2030, almost half a million women will die of cervical cancer, with over 98% of these deaths expected to occur in low and middle-income countries. The time to act is now. 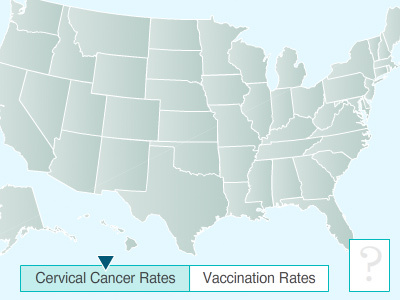 The rollout of a comprehensive approach to cervical cancer that includes the aggressive rollout of HPV vaccines that prevent disease and for the scaling up of screening and treatment options. Women to be encouraged to visit their health provider for early screening of precancers using either the pap smear (colposcopy), visual inspection with acetic acid (VIA) and HPV testing to help diagnose precancerous cells. Treatment of precancers is advancing, which provides hope to the hundreds of thousands of women who missed out on the vaccine. Health systems need to be strengthened so that all women who need access to treatment can access affordable, quality care.